Brooklyn Bedding has been making mattresses for more than 20 years. They bill their latest mattresses as the BME, or Best Mattress Ever. Brooklyn Bedding has built up a lot of hype and expectations for their mattress, and we aim to find out if the mattress lives up to the name it’s been given. Brooklyn Bedding uses a poly foam material called TitanFlex for its mattresses, and this material does a good job of offering bounce and airflow when compared to other foam mattresses that use memory foam or different types of poly foam. If this sounds appealing to you, then you should keep reading for our full review! Should I Buy the Brooklyn Bedding Mattress? The Brooklyn Bedding Mattress is made from 3 layers of foam and is 10” thick. It aims to balance the support and comfort of foam while also providing great cooling and bounce from the latex-like feel created about Brooklyn Bedding’s TitanFlex foam. Top – the top layer is engineered for comfort. It is made from 2” of TitanFlex foam. This responsive poly foam gives plenty of cooling and bounce, and is very comfortable and nice to lay on. Middle – the middle layer is constructed from 2” of TitanFlex poly foam. It is a bit more firm than the top layer, but still helps facilitate the bounce and cooling of the mattress. The fact that it’s a bit firmer means that it does a good job acting as a transitional layer, and it provides the start of the deep compression support for the mattress. 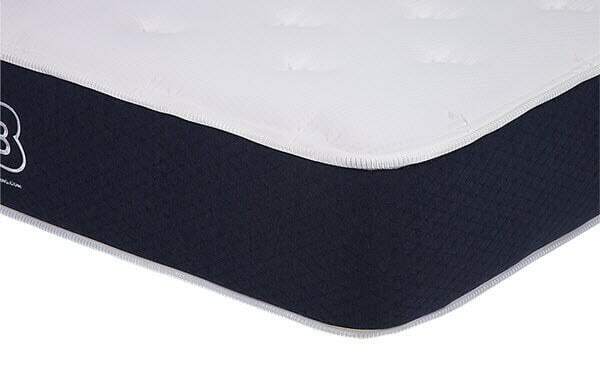 Bottom – the bottom layer is the foundation of the mattress. It is made from 6” of high density support foam, and keeps the mattress breathable while preserving its shape. The bottom layer also does a good job of offering deep compression support due to the high density of the support foam. Brooklyn Bedding uses a very attractive cover for their Best Mattress Ever. It is made from a quilted cotton polyester blend that is very soft. The cover has a ¾” quilted layer of poly foam which means that it has a similar feel to a pillow top when you lay down on it. The result is a very soft top feel for the mattress, but the cotton and polyester construction also mean that it’s very breathable, allowing air into and out of the mattress and the cover to help with the cooling and airflow. The cover also looks quite nice. The top is all white with a blue-grey side panel. 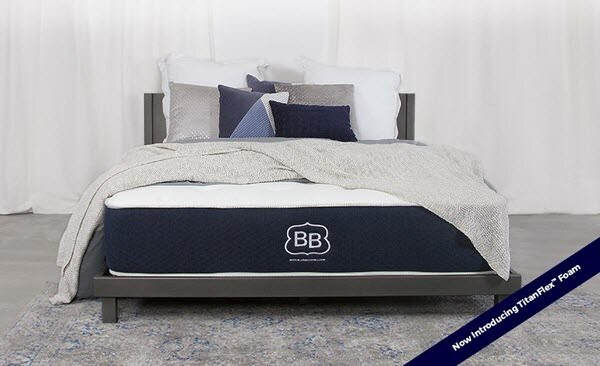 The Brooklyn Bedding logo is on the foot of the mattress, and the quilted top layer adds a nice textured look without creating a strange sensation under the sheets. The cover also has sturdy handles that you can use to move the mattress and lift it for changing fitted sheets. Unlike some of the other mattresses that use handles on the sides, the ones on the Brooklyn Bedding Best Mattress Ever don’t seem like they’re going to tear or rip when you move the mattress around with them. Brooklyn Bedding offers their mattress in 3 different levels of firmness. On a scale from 1-10, with a 1 being the least firm and a 10 being the most firm, the softest mattress they offer comes in at a 4, the middle mattress is at a 6, and the firmest mattress Brooklyn Bedding sells is an 8. This range of firmness options helps make the mattress an attractive option for most sleepers, and there aren’t very many people who can’t find a Brooklyn Bedding mattress to suite their preferences and needs. It’s worth noting that most people prefer a neutral firmness, so if you aren’t sure if you like a softer or firmer mattress, shoot for the middle and you’re likely to be happy with your choice. When it comes to bounce and responsiveness, the TitanFlex foam used by Brooklyn Bedding’s Best Mattress Ever does a good job simulating the feel and qualities of latex. This makes the mattress a good choice for adult playtime fun. 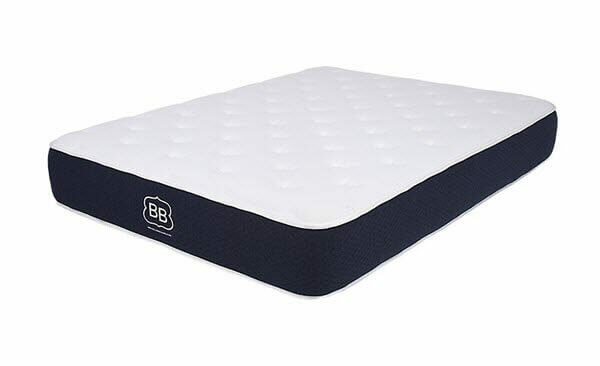 Most foam mattress lack the bounce of a traditional mattress, which can make bedroom fun a bit more work, but the Brooklyn Bedding mattress does a great job of putting some of the bounce back into the mattress. Moreover, this helps prevent the stuck or sinking feeling that some people get with a foam mattress, making it a good option for people who like the support of a foam mattress but don’t like the sinking feeling they can sometimes get with memory foam. The TitianFlex foam also provides a nice amount of hug and contour. It has a moderate amount of sinkage which will let you feel snug without feeling like the mattress is trying to swallow you. Even though the Brooklyn Bedding mattress does have some nice bounce to it, it also does a pretty great job of containing motion and limiting motion transfer. This will make it appealing to light sleepers who get easily woken by a partner getting into or out of bed, and those who have problems tossing and turning at night. It should be stressed that the feel of TitianFlex really is very similar to that of latex. If you’ve ever tried or slept on a latex mattress before, then you’ll have a reasonably good idea of many of the qualities that the Brooklyn Bedding Best Mattress ever offers. One thing to say is that there is a greater amount of hug and contour with the Brooklyn Bedding mattress when compared to traditional latex mattresses, so it does a good job of splitting the difference between memory foam and latex in terms of the qualities and sleep experience offered. We do sinkage tests on all the mattresses we review to give you a better idea of how they will perform in real life conditions. The sinkage tests are conducted by an individual who weighs ~140lbs. This means that your results might be different from ours, depending on your weight. Laying on Back – Laying on the back in a regular sleeping position, with weight distributed evenly, produced 2” of sinkage. Laying on Side – Laying on the side in a normal sleep position with weight evenly distributed created about 3” of sinkage. Slight Edge Sit – Sitting on the edge of the mattress but not putting the full body weight onto the bed caused 3.5” of sinkage. Full Edge Sit – Sitting on the edge of the bed with the full body weight resting on the mattress resulted in 4.5” of sinkage. Standing in Middle – Standing in the middle of the bed with both feet planted caused 5” of sinkage. These sinkage numbers are about what you would expect from most foam mattresses. One thing that could help the Brooklyn Bedding Best Mattress Ever be a bit better is some more edge support, as the limited support in that area of the mattress can limit some adult activities, and while the edge support on the Brooklyn Bedding isn’t bad, it’s still only average. The Brooklyn Bedding Mattress is on the lower-average end of prices for mattresses of this type. To make them even more affordable, there are a number of promotional offers you can find online that will help you save a bit more money. This is also a good place to point out that Brooklyn Bedding offers their mattress in a Split California King, which is a bit hard to find when it comes to mattress. This allows bedmates to have a side of the bed that matches their particular firmness preference, and is a nice added touch for the mattress. Shipping – The Brooklyn Bedding Best Mattress Ever will show up at your door compressed in a box in 3-4 days, and shipping is free in the continental US. Trial – 120 day trial period – a bit higher than the industry norm of 100 days, which is nice. Refunds – 100% money back if requested during the trial period. Warranty – 10 years, which is the industry standard. The Brooklyn Bedding Best Mattress Ever really does do a great job of appealing to a wide variety of sleepers, and there are many people who would love this mattress. First and foremost are those who like a mattress with a good bounce, but want a foam mattress rather than traditional coils or springs. The Brooklyn Bedding TitanFlex foam does a great job of offering all of the qualities of memory foam and latex. The balance of qualities between memory foam and latex also means that the Brooklyn Bedding produces a good amount of contour and body hug, but not too much. The balance is very nice and will appeal to those who like to feel somewhat griped by the mattress without feeling sinking or like the mattress is swallowing you. Most of all though, the Brooklyn Bedding Mattress is a great option for people who want to get a good mattress at a good price. The Brooklyn Bedding Best Mattress ever offers great value for money, and the company has been doing business since 2001. That makes them a brand that you can trust and rely on, especially when you consider the number of new foam mattress companies that seem to pop up every other week. On the whole, most people will be very happy with the purchase of a Brooklyn Bedding Mattress. It’s a great product for a great price, and that makes it hard to beat.